Anne Harvey’s life — the first half of it, at least — reads like a fairy tale. In 1971, a memorial show for Anne Harvey was held at Robert Schoelkopf Gallery. It would be her last solo show for more than 40 years, until now. An American-born artist who lived in Paris much of her adult life, and who did not align herself with any tendency or group, Harvey’s observational paintings were described by John Ashbery, in 1966, as “the probing anguish of an almost Jamesian dissecting eye.” Ashbery went on to state: “A curious anxiety, tempered by the exhilaration of her novel optics is the result.” Ashbery’s praise is precise, and his championing of artists such as Jean Helion, whose later work can only be characterized as Helionian, is, in my book, reason enough to give another look at this nearly forgotten artist whose small circle of ardent admirers included Constantin Brancusi and Alberto Giacometti. Anne Harvey’s life — the first half of it, at least — reads like a fairy tale. She was born in Chicago in 1916. Her mother, Dorothy Dudley, and three sisters were involved in the arts, as biographers, poets, and theatrical impresarios. She was a prodigy surrounded by strong women who encouraged and supported her talent. Without getting bogged down in the biography, as interesting and complicated as it is, I should point out that she met a number of artists when she was young, all of whom recognized that there was something special about her. Jules Pascin drew her portrait when she was 18 and living with her mother in Paris. She met Brancusi around this time through her mother, who wrote about him in an appreciation that appeared in The Dial in 1927, after he had come to the United States for exhibitions of his work at the Wildenstein and Brummer galleries. Other artists who admired Harvey’s paintings included Joan Miro, Helion, and Alexander Calder, many of whom bought work from her. She died in Paris in 1967, at the age of fifty-one. 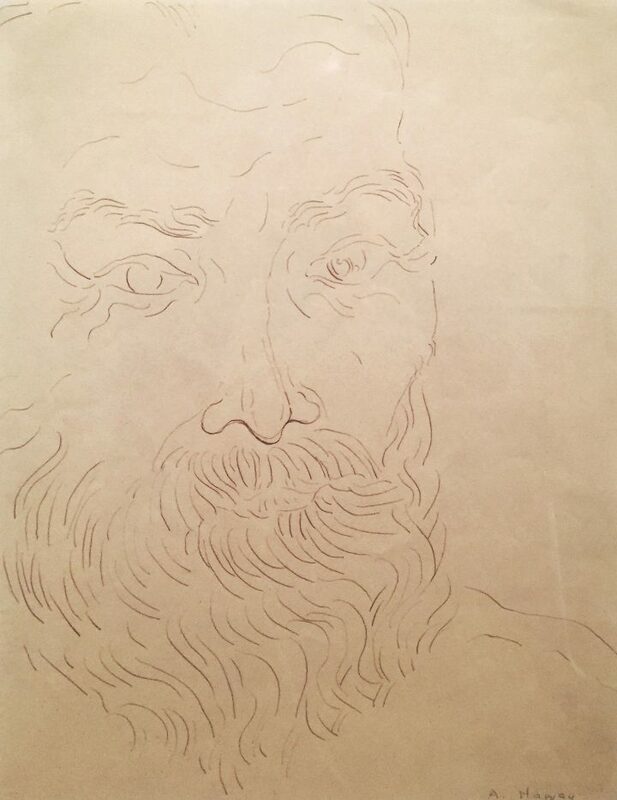 There are two wonderfully sinuous line drawings that Harvey made of the bearded Brancusi, along with two photographs he took of her in his famed Paris Studio, in Anne Harvey: Private Life at Steven Harvey Fine Art Projects (May 10 – June 11, 2017). Harvey’s fluid line is not something you can be taught, which is why so many tough-minded artists admired her work. 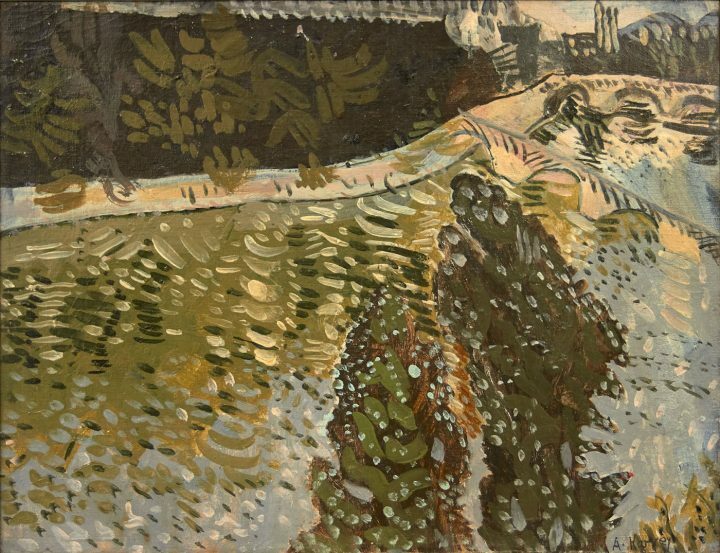 In “Two Trees and A River,” the two trees are in the foreground, cropped by the painting’s bottom edge, of an elevated view of the Seine. Done largely in browns, gray-blues, pale blues, and ocher, the artist has made a series of different-sized abstract marks, which we might initially read as waves and reflections of sunlight, but that impression soon gives way to the pleasure proffered by the marks themselves, which seem to be floating slightly in front of the painting. Harvey’s interest in the dance between mark-making and surface isn’t expressionist (Lucian Freud) or morbid (Ivan Albright). Vincent Van Gogh may have inspired the marks in the river views, but she does something different. Her marks are lighter and thinner, and quicker, making the scene more airy. Van Gogh’s turbulence becomes, in Harvey’s hands, odd and inexplicable. The marks are like accents whose necessary presence you cannot explain. 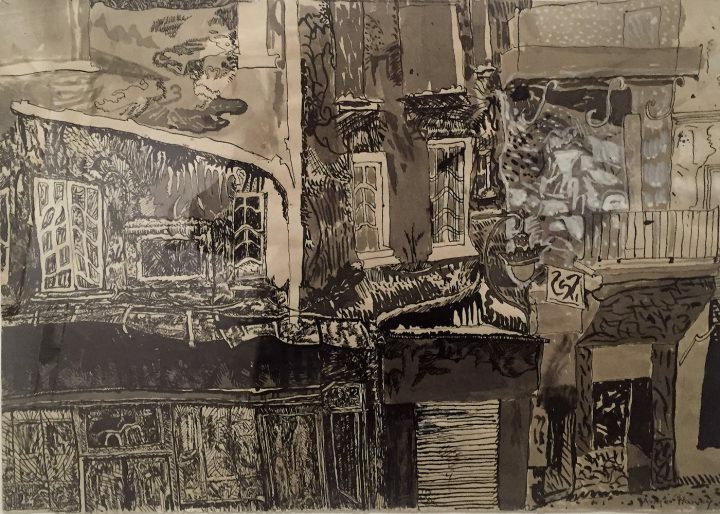 In the ink and gouache drawing, “Buildings, Paris” (circa 1950s), Harvey articulates walls, windowpanes, the accordion folds of shuttered gates, shadows and reflections. And yet, as busy as this drawing becomes, and the attention that is paid to stained walls, the drawing never becomes claustrophobic, which is miraculous. There is in this and other drawings an unerring sense of how much to include, and which spaces to fill with color or with lines. She can make a small space feel bigger and a larger area feel concentrated. 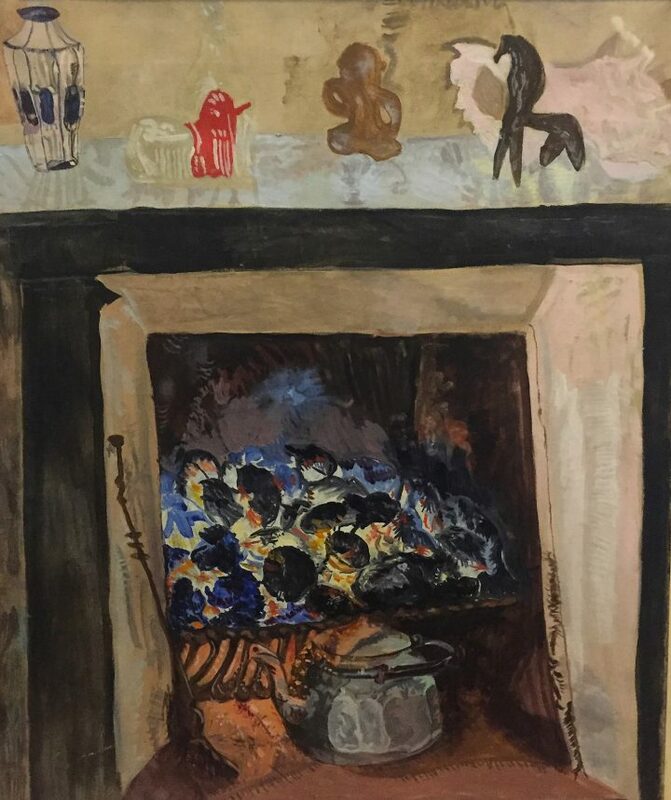 There is also a quirky sense of humor in some of Harvey’s work, such as the painting “Fireplace” (n.d.), where the view is of the fireplace’s cavity framed by a black mantlepiece, which takes up three-quarters of the composition. The painting invites us to stare at the black coals, with their blue, yellow, and orange aura. This is the fire that neither goes out nor warms the room. The subject might be homey, but the painting isn’t. Harvey is an observational artist who never settled into a style: each work was an adventure that might lead to something new, and often did. 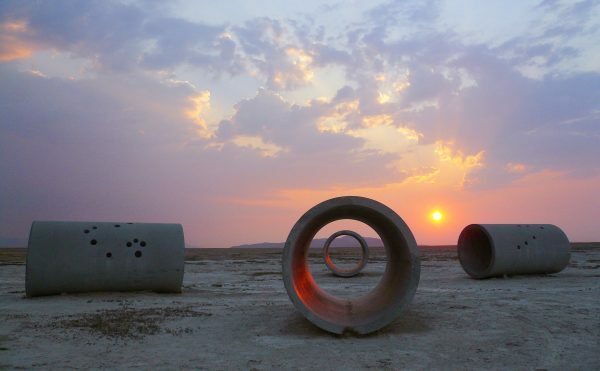 In these and other works, Harvey invites us to see beyond what is there. It is the kind of invitation that can arise out of familiar images associated with transcendental experience and matter becoming spirit. Not so Harvey. Matter stays matter in her work, while simultaneously becoming something strange. How else to explain the three stems in the painting “Tulips,” where each is painted two colors, the most prominent being orange and blue? Is it because Harvey knows we look at the flowers and ignore the stems? Are they meant to distract us from all the attention she paid to the variety of greens on the surfaces of the leaves, some of which appear to have dried out? Harvey’s subjects might be domestic and even sweet, but her paintings seem full of muffled misery. She follows the twisting curves of an ornate, inexpensive flower vase because the act of painting leads her away from her inward turbulence. Better to see what is not there than to remember what is. Anne Harvey: Private Life continues at Steven Harvey Fine Art Projects (208 Forsyth Street, Bowery, Manhattan) through June 11.